Large, bright green rosettes with dark red tips on the lower leaves. Divide babies and root. 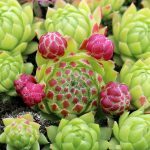 Hen and chicks (also known as hen-and-chickens, or hen-and-biddies in the American South) is a common name for a group of small succulent plants belonging to the flowering plant family Crassulaceae, native to southern Europe and northern Africa. They grow close to the ground with leaves formed around each other in a rosette, and propagate by offsets. The “hen” is the main plant, and the “chicks” are the offspring, which start as tiny buds on the main plant and soon sprout their own roots, taking up residence close to the mother plant.